Math programs can be hard to decide upon. 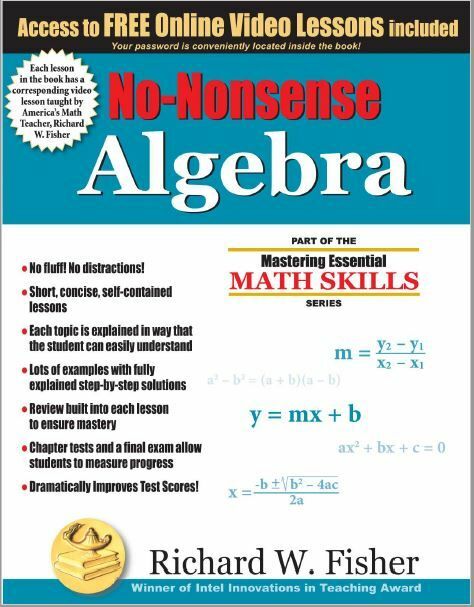 We recently had an opportunity review the No-Nonsense Algebra book written by Richard W. Fisher and published by Math Essentials. The guesswork has been taken out of teaching algebra!! No-Nonsense Algebra has been a great addition to our homeschool. This super-affordable math option for middle school to high school level algebra (depending on where your student is in math). It's only $28.95 and you get a full algebra course, and even better ... you get full access to tutorial videos on how to complete the problems in each lesson!! Each tutorial video is roughly 5 to 10 minutes long, provide a thorough explanation and show examples for your student so they can understand it better. The No-Nonsense Algebra has 10 chapters that start with Adding/Subtracting Integers and takes your students through graphing, inequalities, polynomials, rational expressions, radical expressions and even quadratic equations. There is a video lesson for each of the more than 90 lessons that are provided in No-Nonsense Algebra. Each lesson has review of previous lessons, so that your student is able to continue to strengthen the skills they are learning. No-Nonsense Algebra is a consumable book that walks your student through step-by-step solutions. Each chapter is broken down into four sections. The Introduction lets your student know what they will be covering and it gives the student examples of the new concept they are learning. After the Introduction, student's will get to see an example of problems. This is when you can hop over and watch the video lesson if your student is struggle. They'll see more shortcuts and tips in this area also. Next the student will have exercises to complete with the examples to look at. This area could be 10 to 20 minutes for them to complete with up to 20 problems to complete. The end of the lesson is more review problems for you student to complete. My favorite part of using No-Nonsense Algebra is the amount of time each lesson takes. You can expand out the lessons for as long as your student needs as they work toward mastery. But each lesson is short and helps your attention-deprived student to master their math without staring at a textbook for hours. As we are working our way through Algebra with the boys, I am very grateful that we have been able to discover the Mastering Essential Math Skills series from Math Essentials. I am not afraid of teach algebra anymore, and even better .... I'm actually learning more now than I did in high school!! Math Essentials offers books that help your students from as young as upper elementary, Grades 4-5, through high school. It also breaks down essential skills that your student might be struggling with like fractions, decimals and geometry. Math Essentials has you covered from upper elementary through graduation!! Prices are also reasonable and affordable for families!! Several members of the Homeschool Review Crew got to experiment the world of Math Essentials with No-Nonsense Algebra. Take some time to click on the link below and see how they have used this program in their home.